Difference between revisions of "RACON UserInterface"
As some of the controls completely, and some features of existing controls are missing, I decided to implement this module. Sometimes you just need some special window handles or you want to add some useful features to your application. But why should you implement everything from scratch, if it's already there? This component gives some improvement features! The following call activates the theme consistent drawing of the MDI client background. Currently, this component has just one function, but this function may help you very much! Consider your application has an English UI but if the user runs it on a German Windows, some built in menus are localized. TD's UI library - Prof UI - uses a Resource Manager to display strings and menus based on the Windows locale. 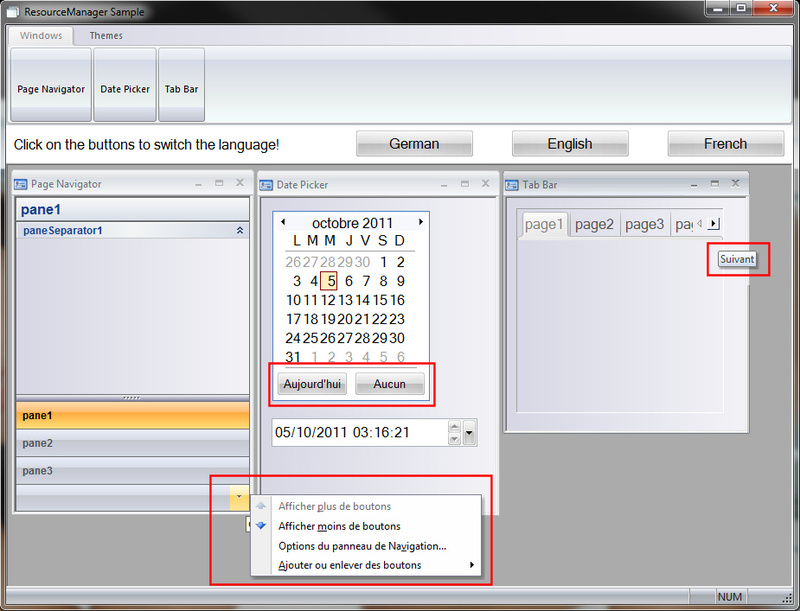 But this Resource Manager has a function to override the system setting and specify another language. This is what this component gives to you! My system runs with German locale, but this call changes the Resource Manager language to French! and introduces some very useful new controls. Some of them already got introduced into Team Developer. As some of the controls completely, and some features of existing controls are missing, I decided to implement this module. This gives the possibility to developers, to use the features before Team Developer has them. And some additional features like Resizing, Popup Tip Window, MDI Background Image or MDI Windows Tab Bar. Background Painting improved, so the MDI client area can be painted using the selected theme. New functions for managing docking/floating Dialogs. New functions for managing Child Grids. New functions for managing the Status Bar. I got support of Unify while building this version to be able to call the newest UI functions. But this implies, that the version needs SP6 to work. Using any other version of Team Developer may break the functionality of this module. Fix of a missing calling convention specification. New functions for controling labels (Background Texts). Splitting into multiple APLs, each for one control. Creation of the module with it's basic functionality. This version is built with Team Developer 5.1 SP 5. Using any other version of Team Developer may break the functionality of this module. This library is meant to be an enhancement to Team Developer until the features are available there. After all of the features are - hopefully - available through Sal-functions, this module will go away. PLEASE NOTE, THAT THE FUNCTIONS INSIDE THE MODULE ARE FULLY EXPERIMENTAL AND CURRENTLY ONLY TESTED AGAINST TEAM DEVELOPER 6.0 SERVICE PACK 4 AND TEAM DEVELOPER 6.2 SP 1. YOU MAY USE IT IN YOUR APPLICATIONS FOR FREE, BUT EXTENSIVE TESTING IN YOUR ENVIRONMENT IS ABSOLUTELY NECESSARY!!! Shows a list of open MDI windows and offers navigation. Displays a tab bar on top of the MDI client area which allows tabbed window navigation. Allows you to display a custom MDI background image and activates theme consistent MDI background painting. Returns the window handle of the MDI client area. Subclasses all child windows of a given parent window to ensure theme consistent painting. Returns the window handles of the docking areas. Returns the window handle of the ribbon bar. Here you can download the necessary files! 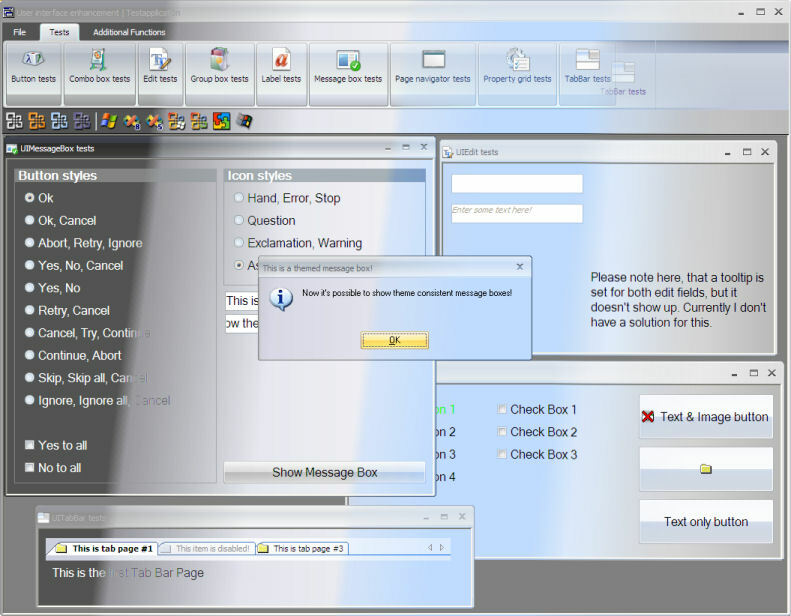 Override the language used by the Resource Manager. This page was last modified on 25 November 2015, at 15:05. This page has been accessed 8,597 times.